Join the fun this Saturday, December 5th at 6pm for the annual Del Ray Holiday on the Avenue. 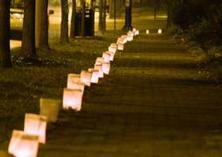 The night will begin with the lighting of thousands of luminaries! It is a sight to see! 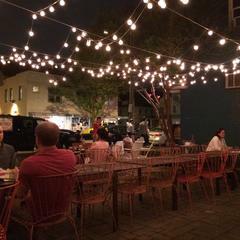 You can enjoy hot cider outside Pork Barrel BBQ. There will also be hot cocoa and cookies available. Carols will be sung – led by the Rainbow Lady, Kate Moran. The TC Williams Choir will also perform that night. The Front Porch, by the Evening Star Café, will be showing favorite holiday classics with seating and heaters available. The big man himself, Santa Claus, will make an appearance and will be available for photos. But the guy is busy this time of year so he has to leave at 7:30pm, so get there early if you want to see him. You can take a walk down Mt. Vernon Ave. and take a look at the decorated trees. Vote for your favorite on-line! In the spirit of giving, the Del Ray Business Association will be collecting canned goods, disposable diapers, deodorant, razors and new twin sheets and towels for Carpenter’s Shelter. The fun takes place at the corner of Mt. Vernon Avenue and Oxford Street. See you there!